RadCartesianChartView visualizes each data item from the Indicator Series using a LineRenderer. The Indicator Series extend CartesianSeries and they require one CategoricalAxis and one LinearAxis. The financial, or also called stock indicators, are mainly used for keeping track of stock prices and patterns of price changes over time. You can find further information about what indicators are and what they are being used for by following this link: Short information about financial indicators. In terms of using the indicators in the RadCartesianChartView you will need to add them as you would add any other Cartesian series. Every indicator has a related formula by which it calculates the expected result. All you need to do is provide the needed data. Indicators that have a category and a value(usually the close) bindings as well as one or more periods. Indicators that have a category and high/low/close value bindings as well as none, one, or more periods. There are some special cases which will be reviewed separately. The following examples will cover the common settings for every type as well as state the specific differences that some indicators require. The rest of the indicators from this category will need the same settings, but will behave accordingly to their own algorithms. AdaptiveMovingAverageKaufmanIndicator needs to have setSlowPeriod(int); and setFastPeriod(int);. 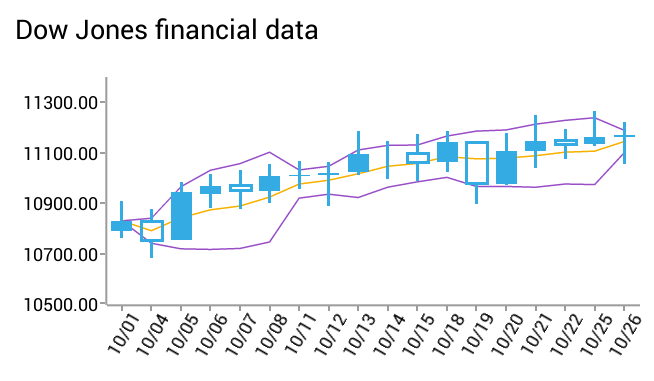 Financial Indicators are using a LineRenderer which makes them LineSeries, that simply have a different algorithm when it comes to handling data points. They can be styled the same way you would style a LineSeries. The default palette styles are still being applied if not overriden by the user. You can also customize the appearance of Financial Series by using Palettes.